Intended for a 1968 television special, but cancelled by Mick Jagger. Acts include Jethro Tull, The Who, The Dirty Mac (supergroup for this occasion, which unfortunately includes Yoko Ono), Taj Mahal, Marianne Faithful, and The Rolling Stones. 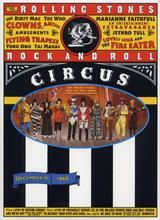 A rock-and-roll time capsule in a circus tent.